The depth of cut can be adjusted without using a scale. The scales of some routers are quite unreliable anyway. 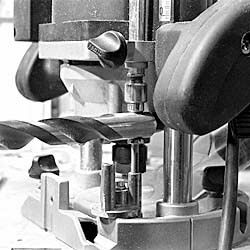 Place the router on the piece you are working on, lower the bit until it just touches the surface of the piece and lock the router. Then put something which is the same height as the desired depth of cut under the depth stop and fix the stop. Feeler gauges are suitable for low-depth cuts and drill shanks (as shown in the picture above) for deeper cuts. When using a template errors in setting the depth of cut often occur because the thickness of the template is not taken into account.